Meet your new favourite piece of hardware. In the two years since we launched the current Raspberry Pi Model B, we’ve often talked about our intention to do one more hardware revision to incorporate the numerous small improvements people have been asking for. This isn’t a “Raspberry Pi 2”, but rather the final evolution of the original Raspberry Pi. Today, I’m very pleased to be able to announce the immediate availability, at $35 – it’s still the same price, of what we’re calling the Raspberry Pi Model B+. 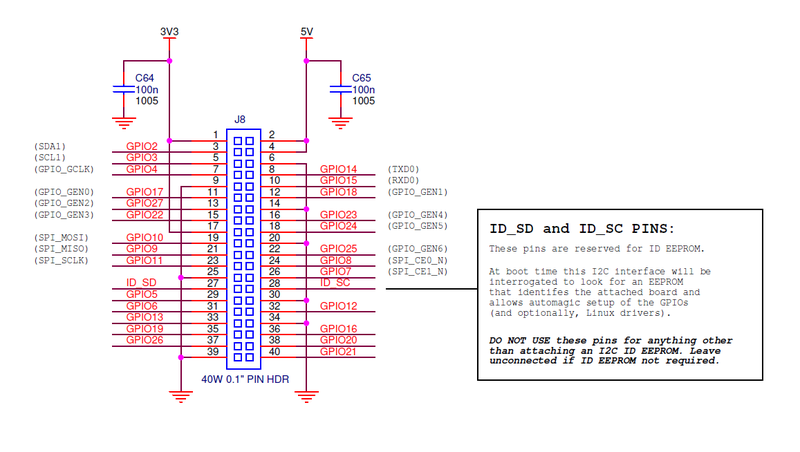 If you’re interested in precise measurements, or want to find out what the new GPIO does, check out the diagrams below. Mechanical specs: you’ll want to look at these if you’re building cases or other housing. Click to enlarge. 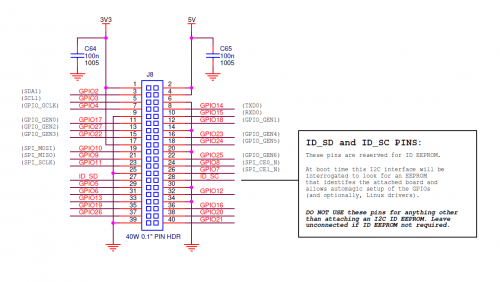 GPIO diagram – there’s a lot more to play with now! Click to enlarge. We think you’re going to love Model B+, but to ensure continuity of supply for our industrial customers we’ll be keeping Model B in production for as long as there’s demand for it. The B+ is available from this morning from many of the regular Raspberry Pi stockists. If you want to go direct to our two main manufacturing partners, you’ll find it at Farnell/element14/Newark here, and at RS/Allied Components here. After playing around with the B+ I can safely say that it is an *immense* improvement. Great work from the Foundation! I can’t wait to see the B+ in the community! Please fix the ‘Click to enlarge’ for the mechanical and GPIO diagrams. Right now they do not work. Some great improvements, i really like the extra usb ports and a micro-sd slot it a thumbs up as they are more readily available!! Yeah – although not to the guy who leaked the news. What actually happened was that a store in Virginia that resells Pis (not one of our main distributors) accidentally put some on shelves on Friday. One guy bought one and took pics. The guy who bought it mentioned it on IRC (we don’t run the #raspberrypi channel – it’s a community effort), but was very cool and took the pics down when asked. Unfortunately, someone *else* who’s been trolling us for a good long time (and who managed to get himself banned from the forums etc. here more than a year ago) copied them and pretended they were his, and stuck them on his website. He was asked nicely to not ruin it for everyone else, but he spent Sunday pushing the info into as many places as possible. Probably the most excitement the guy’s had in a long time – but it did mean we had a *hell* of a Sunday! Well done everyone at RPF, shame it was plastered over the WWW, but unfortunately whatever you do some a**e will always ruin things. Mind you this announcement will still not stop the detractors who want more for less money ! It is bizarre that there are people like that. I wouldn’t have believed it, but I’ve had personal experience with other people doing the same. They’re almost not human. They’re like evolved parasites. I’m sorry that you had the experience too. At least it shows you are successful. Lower power and better audio is absolutely brilliant! Are there any details of the current draw and what current can be supplied? I also would like to know how much power you can cram into this to stop the annoying brownouts when you hotplug WiFi dongles and the like. On the old B I ended up removing the polyfuses so I could use a 2A 5V usb charger. Can this take that kind of power natively or are “non-recommended” user mods still required? Looks great. Hopefully we will see some nice cases for the Model B+ soon. Looks like http://www.tinkerlings.com also has the new version B Pibow cases (not B+) in stock and they are based in the U.S. I sent them a message to see when/if they will get B+ cases. The change of the SD card support is great. I broke my first Pi in two days because of a bad fitting cage. I now have to use it with a stron paper peg. Awesome, thank you very much RPi! Is there enough power in the usb ports to run an external bus powered hard drive without a hub? Believe so, yes. :) We’ve certainly seen that configuration work – I mean, I’m sure you could find a hard drive that draws so much power it’d need a powered hub, but most should be fine. So considering getting a power USB HDD or USB Hub to power anything in the 750gb+ range just to be safe. The “USB limit” doesn’t come into it in this case, but the PI does have a programmable current limiter that per default limits the output current for all USB ports together to 600mA, but with an entry in config.txt this can be increased to 1200mA, if the other USB devices together do not draw more than 200mA there should be 1A left for spin-up. Oh, and good luck with Picademy today – it’s sure to be fabulous again! Well said, Mike! And thanks. Still missing 1Gb ethernet, 1 SATA connector at least, and, what will be goal, PoE or any better power connector. Missing? Why would something be missing that most people don’t actually need? Note this is an evolution of the Pi – your changes would need a new SoC. That would be an entirely new Pi and not as backwards compatible – which would be a mad thing to do. My second thought was that the extra USB with a bit more oomph in them, the micro SD, the four mounting holes and the revised port layout nicely solve all of the issues I’ve been coming across when working on a design for my cluster. Kudos to the Foundation, and many thanks. I wouldn’t write off PoE functionality so fast. Proper PoE support is actually quite expensive to add to a board – that’s the real drawback. POE was designed to deliver substantial ammounts of power down long cables that weren’t originally intended to be power carrying with a high degree of safety for both personnel and equipment. 2: a collection of eight diodes to deal with polarity reversal and the multiple powering options in PoE. 4: an isolated DC-DC converter to go from the ~48V of the PoE line to your system supply rail. All those extra components add up to being prohibitively expensive for the Pi. We plan to have two SATA interfaces on at least one of our Pi Compute motherboards! I saw the pics first thing yesterday, but held off posting till it was near enough plastered all over the web, ended up being a late night. Congratulations on the B+ their are some very nice changes to the original design and it’s great to see the RasPi evolving. Thanks George – it’s appreciated! With switching regulators – nice. Does that make it lower power than a model A? Great so see the changes, and Pi moving forward. How is this automagic going to work ? does the microsd slot mean no more sdcard corruption or is it literally just a different connector? will 4 usb ports be less flaky than via a powered hub? just thinking it was bad enough with usb/ethernet being shared before, but now twice as many devices…. what’s the new minimum power requirement with the new regs (and more usb/gpio) more or less than the previous 700mA? I often hear complaints about this when researching the Raspberry Pi. Is this something the team is planning to address, or is it a rarer problem than I think? The USB powrchain has a proper limiting switch and will not brown out the board if USB devices are plugged in when powered (or even if they try to take too much current or there is a fault like a power short). Default allowed USB current across 4 ports is 600mA, but can be increased to 1.2A via a config.txt parameter if a good quality 2A PSU is used. I have tried a few different USB hard disks and they all power fine directly from the Pi at the 1.2A setting. How can I modify the config.txt in order to support the 1.2A for the 4 USB? i think he’s referring to sdcard corruption, not usb power issues…? I don’t think the Pi itself corrupts SD cards, it’s just that many SD cards are not suitable for running an operating system from. Many small writes and reads to the same few cells of flash memory (e.g. running an OS) is a good way to corrupt a cheap SD card. This is indeed a great news for the open hardware community. But in my country your main seller http://www.element14.com is selling Raspberry PI for Price: Rs.3,166.00(Price is before tax) which is $52 , which can never justify the price $35, it is $20 extra, which I am sure that is really more to ask for shipping and handling for such a small device. Oftentimes an increased price like that is due to import taxes imposed by your country. Hi, it is true that element14 have different price for diferent B version in my coutry B+ cost 7US$ more then B version vithout tax. It is hard to belive that transportation (i am in EU) cost more fore B+ version. I bought one from RS components(India) at 2900/- which in USD is $47. This looks amazing!! Wanted to know if B+ is available in India? With the rounded corners it shouldnow fit in an altoid tin. Someone at RPi must have tried it, right? Please read and learn, it is not feasible without a complete redesign, if the RPF undertook your wants everything achieved the last 2+ years would be obsoleted. I am talking for a different model , not a revision of B+. Choice is good. As there are users for model A, then a more beefed up version will also find its uses (Raspberry Pi Server?). It doesn’t need to be the same form factor, can be more expensive. Throw a cheap Raspberry Pi branded switch in the mix and we have the complete infrastructure for the schools to play on it. There are systems on the market or about to be released which deliver more power and the Gigabit Ethernet, e.g. Humming Board, Banana Pi, ODroid U3, Radxa but are you also willing to pay the increased costs (about 2-5 times that of the Pi B+)?? A+? For reduced, embedded, and low power operation? Currently stripping off the 3.3V on Model A and adding a switch mode buck through an add-on board. I would like to see a Model B- I guess. It comes with none of those fancy connectors to solder on so that the highest point is the power supple cap. For many of my applications, this would be ideal, and I could make the connections as needed. And surely they could save enough money scrimping on connectors to offer it for the price of a Model A or better. Maybe it could work for you? Conclusion is it’s not gonna happen. It has now reached a point like bicycles where the number of Raspberry Pis that I need is always the number I’ve got plus one. In ‘C’, ++PiCount; is usually slightly more efficient. Just to go off topic, shouldn’t C++ really be called ++C? Wow,that looks awesome. I really want one but I’d feel bad leaving my existing model b in the lurch. Does this mean the pi can now power things over USB like memory sticks/small portable HDDs/WiFi cards? That’s a pretty killer selling point if so. Being able to power more powerhungry USB devices is really a great enhancement! And 2 more USB ports, I like. You will need a good PSU though! The input side will handle up to 2 amps, so if you want to feed those power hungry 3G/4G dongles then make sure your PSU is up to it! This is a bit of a letdown, everyone hoped for dual-core, gigabit and usb3. No they didn’t. I didn’t. Everyone – 1 != Everyone. Anyone who reads this blog regularly will know that this was never on the cards. Please read previous comments. If the Foundation released those kind of changes then all the work over the past two years would be obsolete. There are other more powerful solutions out there but it was important, at this stage, for them to maintain compatibility. I didn’t hope for those things either, so -2. Yeah, I’m far from disappointed with this. It does most everything I would’ve hoped to do with the CM and more and I didn’t have to do anything but wait for it, so I’m absolutely thrilled with this update to the Model B. Ordered my first one just now and it should be here this week. not looked yet, but do the extra gpio’s happen to be the ones used by the 2nd camera interface? as that would have been awesome? +1 to USB3, dual-core and Gigabit. Would also add 64-bit ARM CPU and eSATA ports to the wishlist for the next Raspberry Pi. Good, but could have been better. The arrangement and connections are a big improvement. I was hoping for more RAM. The bigger thing I don’t see be support for sleep or off, or similar power mode (even simply for a clean shut-down or reboot). I can send indications through the GPIO (and wonder if any other GPIO pins can act as shutdown/active indicators – I think the UART tx pin, but I want to keep the UART). But it would have been useful to just be able to connect a battery to the power in. get an odroid then! but don’t com crying to me when you have to pay $80 extra for a emmc module to keep up with all the other hardware and software to waste the cycles on! What about audio jack? What about easy portable audio players? What about 2 I2Cs?? i have been using I2C-0 and I2C-1 simultaneusly!! This raspberry pi is nice improvement. I’d like to see all the connectors on one side of the board, but this is huge improvement to the model A or B.
It’s nice that there is 4 USB ports so now mouse, keyboard and thumb drive can be plugged in. MicroSD is improvement because I have really a lot of microSD cards and no SD cards or converters. I have 3 Raspberry Pis running about a year now with uptime more than 100 days. They are all connected to solar power plant with RS485 converters and running 123solar. I’m very impressed how stable this is. > MicroSD is improvement because I have really a lot of microSD cards and no SD cards or converters. MicroSD is not improvement because I got a lot of SD cards and now they won’t fit. But I get RCA user can complain of redesign too. Gigabit ethernet uses more power than Fast ethernet. I’m glad they didn’t go that route. I guess the people wanting to run a media center off the Pi would want that, but I think there are better solutions for people who want to run a media center. I was thinking about updating my 256Mb Pi model B when I saw this. You DO know when to dangle the carrot that bit closer…..
Looks good, but please do something about the Ethernet. Get it off the USB bus. That’s not really possible with the current SoC. Will the expansion boards work with it? Could not you make it more similar to model B? Ie. put all sockets in similar position to use old cases with small hand-made changes? Why the Micro SD card is not fully covered by the board? Do we need smaller form-factor for everyday use? More GPIOs? There is a compute module for it. I think you should make the baseboard for compute module price more affordable and it would resolve all problems. Do the new power supply circuit include charging componnets (like int the BBB)? Why there is no so fast development on more needed things like good and cheap display. Please buy the original model B. That appears to be what you want. For those people that want 4 USB ports, better power circuitry, better audio, better socket positioning and uSD card that doesn’t stick out (as much), you should buy the B+. For those in industry, buy the CM. Something that would, however, have been rather convenient (maybe for a future version?) would have been to replace one of those USB-A sockets with a ‘standard’ 4 or 5-pin header (or two USB-A connectors with a 9-pin motherboard usb header) to allow direct usb access to stacking expansion boards. It is already currently achievable even with the classic model B but requires some rather ugly mechanical hacks due to the USB connector footprint being different from that of a 4-pin header with 0.1″ spacing. Problem is that the huge majority of people want a normal USB port, not a pin header. Making it a pin header just makes life more awkward (and expensive) for the majority of users. Will the Model B still be available ? Yes, as stated in the post. Yes for as long as there is demand and to support industrial users. Now that the corners are rounded will it fit in an altoids tin!? Apparently not, according to one of those embedded videos. No real time clock! No audio input! If the power input supply enough power, will each USB port provide 500mA output as in spec? You say that you’ll keep the Model B in production while there is demand, which makes sense given the number of cases, and accessories, and to provide drop in relpacements etc. I’m guessing demand will drop of quickly though given that one of the main suppliers (element14) seems hto have remove the Model B from their site altogether. There won’t be any demand if you can’t actually buy one! It seems to still be listed on RS but for how long? We stopped making Model Bs for a month so we could fill the channel with enough B+ to deal with the demand we get when we make a new product. They’re back in production again now, so you won’t have to wait for long. I totally agree with those few, who despite of all of those fanboys, wonder why after two years, the pi foundation does not release a more up to date model. All former projects would be obsolete? That would be a bummer, if the community was small and there would be a large burden on very few people. Additionally, the pi was been sold so many times and this new model, despite only having a very few minor improvements, still costs the same. So fanboyz now go on, shred me to pieces, but be aware if you leave this blog and some other select forums, you might come across some people, who actually agree with me. Is that enough shredding for you? This is an evolution of the original design. You’ll have to wait longer for revolution. For example, can you name me an SoC with a VideoCore GPU in that could be used*? An awful lot of software on the Raspi has been optimised to run on the VideoCore. $100k’s worth. And what about the camera port? Do you think it is a good idea to throw all that away? So projects that would be obsolete include – all the camera work, Maynard/Wayland, optimised web browser, anything that attaches to the GPIO’s. Which I am sure you will agree, is a LOT of stuff that would need to be done all over again. So, instead of going on a rant as to why the spec doesn’t suit what YOU want, try thinking about why the Foundation is doing it this way, and think about the spec that the Foundation wants. The appear to be other SoCs with amrv7 and videocore4. https://en.wikipedia.org/wiki/VideoCore#Table_of_SoCs_adopting_VideoCore_SIP_blocks maybe one of those is suitable. Otherwise is it worth sinking another $100k into videocore if it is a dead end? Were does raspberrypi aim to be in 5 years? There are chips out there, but they all have some sort of limitation that means they are not suitable. Be it power requirements, lack of some area of multimedia support etc. As for the roadmap, the Foundation always keeps that very close to their chest. I wonder what volumes you need to be able to influence broadcom’s SoC designs. In the early days with expectations of a few 10k units, they had to use what ever they could get. But if you want 1 million SoCs can you ask for a custom design? Given the development of cost of an SoC runs in to multiple $M you have to sell a lot of stuff to be able to influence/customise design. It also takes a LONG time. That’s not to say the Foundation are entirely without influence, but they are not in the same league as Samsung, or similar. You wouldn’t be throwing all that work away as people would still be using the original raspberry pi’s. Right now the 1ghz arm v7 hummingboard is a much better option aside from the closed source gpu drivers. One wonders why you bothered to post in the first place. I’m happy to say I’m a ‘fanboy’ (thought I hate the term) and I think the B+ is a good evolution. There are other boards out there that probably do what you want but aren’t aimed at education and a low price point. I agree Paul, why not just produce a version 2.0 ? It’s like the whole apple thing with lightening connectors, non of the accessories will work/fit. Well, all the accessories that plug in to the GPIO should work fine – that’s backwards compatible. Cases will need to change, but if you are buying a new Pi, why not buy a new case to go with it. its hard to follow the twists and turns of many of the conversations here because of the double negatives, and convolutions of Yoda-Style sentence construction, but the only main issue with the eventual disappearance of the B is the case and perhaps mountings. It looks like manufacturers have been advised ahead of time, with the intent being deprecated case stock should roughly equal unsold model B’s. It will be known soon enough if model B sales are going to continue strongly to justify a case manufacturer pumping out a few more models for while, then I don’t see an Issue. I think the foundation is lucid enough to keep communicating. The whole spirit of Pi is to overcome minor challenges by rolling-yer-own solutions, as opposed to off-the-shelf-completeness. Today, I have a plan to by Raspberry Pi model ‘B’, Now I fortunately make a new decision to model “B+” :). Did you remove the pins from the P5 header on this model? If yes, will the “old” Model B still be available? I thought the BCM2835 only had two channels of USB (hunting for the original schematics under a pile of other schematics). Does this mean the extra two ports are paralleled onto the existing or there is now an extra hub? It’s all channeled down one USB port in to the SoC. In effect, the two port hub/ethernet chip has been replaced by a four port one. So it is using 9514 instead of 9512 ? Will accessories using the 26pin connector still work on the 40 pin connector, is the new one just an extension ? Looks good, but what has happened to the P5 GPIO 28 – 31? Is there any option on B+ for high performance audio or 2nd I2C? The P5 header has been rolled into the 40-way GPIO header. The GPIO schematic shows that GPIO0-27 are now present on P1. Oops, forgot to add that the I2S peripheral is also available on GPIO18-21. Yes, but in order to use the change I2S GPIO pins – a kernel patch is needed (different pinmux). Billions of blistering barnacles in a thundering typhoon. BTW: if you run B+ with the currently latest Raspbian (or Volumio) and snd modules in /etc/modules – your RPi will hang if I2S is used. The Kernel Patch is needed. Functions still available on the 40 pin, but different lines. Everything I like. Only thing I was looking forward too was 1GB RAM. AIUI while the SoC theoretically supports 1GB of ram nooone actually makes a compatible 1GB chip and given that it’s an older technology it’s unlikely they ever will. Now that the GPIO has 40 pins, could an off-the-shelf PATA/IDE ribbon be used to break them out?? RS in South Africa now just has to add this to their online shop! Thanks Nico. To all those .co.za inclined: The PiFactory has ordered 200 B+ units – they will be here by the end of the week! Thanks nico & Rocsta – that’s good to know for us South Africans. Is this new model supports OpenCL? I’m still confused as to why the foundation hasn’t moved to BCM11130, it is the successor to the BCM2835 and should be economical? Give that the BCM11130 has ethernet MAC and USB on-board it would reduce the cost by removing the SMSC hub and only need a PHY. Perhaps Broadcom can’t release that chip into the public domain in the same way as the BCM2835 because of the security module, which would be a shame. BCM11130 is based of ARMv7 and not the Pi’s ARMv6. It is not a direct replacement, so want you want is a new Pi and throw away everything which has been developed the last 2 years ! ARMv7 is backward compatible to ARMv6. But other things can make it incompatible with the old one. And of course when an ARMv7 one will came out then a part of the community will drop the support for the old SoC. Anyway, I like the B+. Also I think the critical voices are also useful, because they can point to problems that can be resolved later. Any supplier with international shipping to Argentina? I bought my first one from RS but now it seems it does not send here anymore. You guys couldn’t stop Germany. We needed you!!! Great, this solves a lot of issues with the original Pi. The extra USB’s are going to be super useful. I am missing a second camera/display ports a bit though :( (since the Compute Module does have these, I was hoping there’d be a new pi with these on it as well). And is the second UART connected on the extra GPIO’s? They’re all marked as “GPIO” on the schematic above but most have double functions so I was hoping the second UART is connected on one of these. Makes embedding in a larger case much eaiser. The right edge can goto the outside unmodified. The bottom edge only needs extensions according to how you are getting your AV out (HDMI or oldschool). The power + SD would be internal to the box, so “no user serviceable parts”. And the 40 pin GPIO lets you use unmodded IDE cables. The older one did but you had to cut them down the 26 pin so they tended to fall appart. Exellent upgrade. A+++ to Eben et al. Probably was Mooncake’s idea really. looks great.. but so far element 14 seems to be selling it at $50 rather than $35… am I missing something? misprint? I see you got rid of the big capacitor! That price was an error. It is now showing $35 on the element14 site. yes.. thanks.. I got an email from element 14 and then I bought it for $35 .. they had 3,400 at the time.. plenty of stock..
Nice as they are I would have done without all these additions if instead the new model supported wake on LAN and had a fix for SD corruption. Many causes of SD corruption have already been fixed in the firmware (start.elf) and Linux kernel (kernel.img). If you haven’t already, try upgrading to the latest Raspbian. I have tried that without any significant improvement. Still regardless of my little gripes, thanks for a brilliant product, even with its little annoyances. I’d just got my head around using shift registers for adding inputs and outputs so what do the Raspberry Pi Foundation do? Go and increase the number of usable pins by 50%! Seriously though, an excellent “refresh” that addresses some of the main niggles – especially the 4 USB ports. On the other hand, the change to MicroSD, whilst welcome for new projects, means I can’t just swap the SD card out of an existing Model B – I’m not aware of any way of transferring the contents. You could take an image of your current SD card and re-write the image to a micro SD? That’s assuming that the capacity of your micro is at least as large as the SD. Thanks for doing this. One of the things that keep putting me off running my Pi was the extra faff with the power supply just to run my USB hub, to overcome the lack of USB ports. The fact I had to power down my PC, which is used heavily by my family, so as to use the monitor, keyboard and hub, kinda restricted me in how often I could play. The extra USB sockets will be very useful. There are probably a lot of people running with a keyboard, mouse and something else such as a USB wifi thingie. I can’t wait to get my handy on the new model. We are using raspberry for odb car diagnostic for long time logging. I’d pay $10 more for PoE. And I’d LOVE to have a power connector that is just a set of pins. Micro USB blows. With the original pi you can power it through the GPIO header just fine. I’m not sure if that’s still possible with this one but I’d assume so? Any possibility that GPIO’s can be made 5v tolerant for easier interfacing with with most digital sensors and micro controllers? That’s another £30 spent on the Raspberry Pi. Glad I waited. I’ve been meaning to get a new Raspberry Pi as both my Model A and B only have 256MB RAM. I now feel like my Raspberry Pi tinkering will be more enjoyable with the extra GPIO and memory. Also, perfect timing as just bought an 8GB microSD and microSD adapter for use with the Pi. Looks like I won’t need the adapter, or it means I need another SD card. On a side note. With the curved corners and the connectors moved it just looks better. You know the feeling you get when you are not expecting something to get better and it does? The B+ has just done that for me. Looks a great improvement. Keeping backwards compatibility with existing add-ons (mostly), but adding more functionality. Just ordered one – looking forward to trying out all those new GPIO ports. The B+ looks great and I’ve just ordered a couple. However I have been using the Model B in a number of customer projects. You state that the Model B will still be available but Farnell UK have removed the part from their website and phoning them a few moments ago I was told they are not going to stock then anymore. I don’t know if this is true or whether the person I spoke to was not properly informed. Clicking on the Model B on the RS website says they are available from 23/12/14! Am I stuffed if I want any more Model Bs until then? The Pi Hut still have some and are selling them. I personally have no problem with this being a tidy-up rather than an upgrade as such. I would’ve liked a soft reset / power button (or header) though, rather than having to hack something up with GPIO and a script. Does the SoC support something equivalent to a PC-style soft power button event? I have just seen that the RUN header is the same as P6, so that is good. since the composite now is in the same plug as audio, does the cable needed to use it come with the pi B+? No, you can use a generic adapter, or adapter cable, made for (among many other things) the iPod. That means that most of the cheap Chinese ones should work, as they copy the Ipod wiring. There are adapters/cables though that are wired differently, so you should be carefull. Some cables will only work if you swap the yellow and red RCA plugs, some from randow sources wont work at all if they do not use the ground wire correctly. Normal stereo audio only (i.e. headset) plugs can be used as normally. One of the immeadiate effects of the doubling of the gpio, is it will now be possible to run a 3d printer/cnc rig direct off the board. Each stepper motor driver needs 3 pins, and there are up to 6 steppers. Analog and digital inputs are not timming sensative so could be multiplexed via an i2c expander, but steppers need high pulse rates, and its not feasable to do that via a serial bus. Thats why arduinos etc excel that that activity. This may change things, its going to be easy to prototype a board that connects up 4-6 pololu drivers to provide x/y/z and extruder drives. As far as i am aware there are no i2c based io expanders that can generate syncronised pulse trains to multiple stepper drivers at a reasonable speed, the serial bandwidth is way way too low. To be effective the pulsetrains have to be synced so that when you are moving simultainiously in x and y, that you can control the acceleration curves so that both motors settle at the destination at the same time. If you know of suchca device i would be very very interested. Funny. You don’t improve on the two parts that are the biggest ball-and-chain of the Pi; the dog-slow CPU and the measly amount of RAM. Changing the CPU would mean a significant investment in terms of technology and manpower. A new version with a new CPU would also mean splitting the community and effort as the new chip would be undoubtedly ARMv7 as opposed to v6 which the Pi currently uses. If you want a more powerful CPU, there are other boards out there. Why is that funny? Is it the Foundation problem that the current generation of coders are just not very good at code optimisation? Or is the fact that the Pi forces people to write decent code a problem to you? This record has got stuck in May 2012, try a different tune it will be sweeter, ie buy a different board ! I know the replies to this email are correct. Just feel an explanation might be more in order rather than a longer version of RTFM. The Raspberry Pi has attracted a broad audience and so a fair number do not know the technical details. 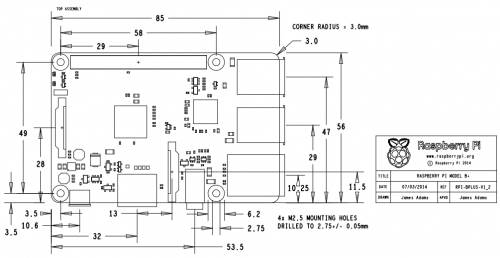 The Broadcom BCM2835 which is heart of the Raspberry Pi is a 700MHz ARM v6 process. The v6 can only be single core and has a limited maximum clock speed. It can be pushed to 1GHz but not really beyond that. The memory controller is built into the BCM2835 and in theory could support 1GB of RAM but the chips are not available so the maximum it can be configured with is 512MB. It’s 1 RAM chip sitting on top of the BCM2835. No option to add 2 chips. So, the Pi is running as fast as it can with the maximum amount of RAM that is available. So, for the Raspberry Pi to have a faster process and more memory it would mean changing the chip at the heart of it. Which would make it a completely different computer. Different pin out, different built in functionality, different wiring, different operating system as it would use a different instruction set. All of this would break backward compatibility. With the educational focus of the Raspberry Pi providing computers that are compatible so the same code and course material works on them all without modification is the priority. A simple analogy would be buying a Ford Fiesta and then wanting it to be a V8 turbo charged beast that seats 9. Both are cars but you couldn’t modify a Fiesta to make the second. It would need a complete re-design. Same with the Raspberry Pi. If you are looking for something more powerful then the Beagle Bone Black or the recently announced BananaPi look interesting. Neither run Raspian, or support the Raspberry Pi libraries, or work with the camera board, and for me most importantly, neither of them have this amazing community that keeps giving new code and demonstrating new capabilities for this small slow computer with limited memory. Also, they are a bit more expensive. Personal note: I’ve been using a Model B with 256MB RAM and everything I’ve wanted to do on it has worked, even Miecraft and XMBC. The average 3d printer controller has 128-256k (not m, k) of ram, and runs on an 8bit 16mhz cpu. Compared to that a pi with 512mb, 700mhz 32bit cpu is an mcu on steroids. Composite is still there – it’s now on the audio jackplug. KACKPLUG? I don’t like the sound of that. Otherwise an all round excellent evolution of an already incredible device. RS Australia certainly aren’t selling them for the same price. They stuck a 50% markup on them. Its the same thing in NZ with RS. Element14’s local resellers are way over priced as well. One of them sells the B+ for a few bucks more than the original Model B. Way to go. Well done on the new model! I love the extra USB ports with more power, having a separate USB hub was a pain. Also great is neater cable management and better audio. I think removing the composite video port was the right move. I’m guessing that I have to thank Liz for adding them – Thank you. Is it necessary to use a 4-pole jack to get audio from the new av connector or will a normal stereo jack pick it up and ignore the video? I have a house full of standard audio ones but no way of getting a 4-pole one without a long delay and disproportionate shipping charges. I was pleased to read that the quality of the audio was improved – does this include raising the output power a little? The current models require raising the volume on my stereo to a level that is dangerous if I forget to change it before changing source! Plugging a standard stereo 3.5mm jack into the socket will work for audio. The output impedance and buffering for the audio port has been improved and the maximum output amplitude has been increased (~1.25V pk-pk). Thank you. I use hdmi if I want video but I normally work headless over VNC so that I can leave a Pi over beside my stereo as a webradio. You Pi-guys are just *beyond* awesome! :-) I’m so impressed with all improvements on B+! You expressed all my thoughts perfectly. Well done, RPF. Thanks – that’s really nice of you! Congrats to the RPi team! This is a super update, and everything I’d hoped for. I’m looking forward to seeing the new schematics and power specifications. Producing these Die-Cast parts meant we have invested heavily in tooling. The layout of this B+ is so different it means we cannot use this new board in the Zinc case! How long will model B be available for? Will the layout of model A also change? As it says in the post, as long as there’s sufficient demand for it. Would it be possible to send me a DXF of the model B+? I might be able to design this board into my exising product? Nice refresh. Makes sense to solve as many of the small issues as possible, while remaining on the same SoC. Improved audio is good, though the wolfson card was decent work around (would be nice if raspbian supported it). I hope the USB changes mean less interference with the ethernet, which will make the pi better as a NAS. Also wonder if it will help with USB DACs. Looking forward for Maynard to go from interesting tech demo to useful desktop, but the git repo is pretty quiet. Could the foundation set up crowdfunding to speed up the work? I’m still looking forward to an armv7 version. It will have to happen at some point. Is it better to spend lots of dev time over the next 3 years on armv6 specific optimisation, or to make the break early so that the raspberrypi2 can be a very usable desktop. https://en.wikipedia.org/wiki/VideoCore lists some armv7 SoCs with videocore4, so surely all the existing software would work (or require only minimal porting). While there are more ports and better overcurrent protection the USB setup has not fundamentally changed. It’s still a single USB connection from the SoC going to a USB hub with ethernet chip from the same series (4 port version instead of 2 port version but that won’t make much different). I find this to be the strangest change of all: For the original Pi every step in the process was published in great detail, whihc was very fun to read and really got us all excited. But now (and with the CM) the first we hear of it, is when the product goes on sale. I guess there will be a model A+ because the model B+ is more different from them Model B than the Model A is. They should have called it model C, but that would make it hard to make the same changes to the model A as it would than be called the model D, which would become confusing quickly. The model A is a model B without the ethernet+hub chip. I see no reason why they couldn’t just leave that chip from the B+ and have an A+. When you’re actually shipping kit you can’t be as open about future products as when you’re not, as a lot of people will decide to hold off buying the older product until the new one comes out – and that’s painful with offices to run, bills to pay and staff salaries etc.. Exactly – and it’s unfortunate, because we *like* to tell people what we’re doing (we think this stuff’s really interesting, for one thing), but with the Model B the main revenue stream (not only for salaries and the office, but also for the charitable fund we run) we can’t jeopardise it by creating a situation where people decide to stop buying it because they’re waiting for something new. Lucky they are not THAT expensive. It seems there is no such thing as a “spare Pi”. You always can find a use for it. Any plans to update the gertboard to 40 pins as well ? Are there any plans to add wake on LAN? Brilliant that you reduced power consumption once more. I hope, there will be a Pi with 1GB RAM and the same power consumption in some time. Nice upgrade; I want one but I don’t need one. My models A and B are working just fine. I really like it how you have managed to keep the price point and still including upgrades. Having the extra USB ports and the associated power improvements is nice; don’t think they were required but certainly a nice addition for sure. Mechanical specs in DXF. That would be awesome. Pretty please with sugar on top. I’ve seen the bloopers a million times now and it still made me laugh this morning. why no add second rpi camera too! That would mean that the PCB needs extra layers to support the extra high speed paired and length controlled CDI connections, which is expensive, much more expensive than just the cost of a second camera connector. On the compute module they probably did add the extra layers, as they wanted to route -all- pins away from the SoC’s BGA, but is not the case on a regular PI. I’m a bit confused. This is going to take some time to sink in. Raspberry Pi Model B, you’ve changed? But I thought you were lovely just the way you were. I think that the changes are great from a technical point of view. Who doesn’t want more for the same price? But I think that this could cause a lot of confusion, especially amongst newcomers, or more casual users. There are what, 3 million or so of the old form factor Pis out there at the moment? So it’s going to take a while before before the B+s become dominant. In that time I could imagine that there could be quite a few people buying cases or 3rd party add-ons for the Pi, for themselves or someone else, and going ‘what?’ I got a Model B accesory when I needed a Model B+ accessory (or vice versa) ‘how annoying’ (or more colourful words to that effect…). Can the new GPIO pins be addressed in the same way as before but with the new (higher) numbers? Well, for $6.68, here for example! 8GB is ideal, unless you need higher capacity. Class 4 is recommended. Hopefully http://swag.raspberrypi.org/products/noobs-8gb-sd-card will be back in stock soon? Guess which supplier I ordeded from! It’s much closer (£31.20 vs £31.03) when you factor in next day delivery. Ok that’s great news. Looking forward to buying one in future… because dammmit I just got a B model for my birthday and haven’t even used it yet. Can’t complain about a gift but this could have been so much better. Nice improvements! Too bad you’ve now obsoleted all of the Raspberry Pi cases and accessories out there. There was a big market for that stuff with a lot of vendors… I’m not sure if they’re going to refactor all of their wares for a non-upgraded model with a completely different footprint. We’ve certainly not made anything obsolete! The pinout for the first 26 pins is the same and many boards will still fit. Not to mention the fact that there are 3 million Pis out there in the original state. Also it opens up opportunities for retailers to make new boards! Our PiCE case can no longer support these changes! Ordering a B+, but my B will go into a PICE next month. Think the closing-down sale was a bit premature? Still no way to shutdown without a keyboard / network. Was hoping for a couple of pushbuttons tied to GPIO pins, one of which I could use for that purpose. Good to see all the ports getting aligned. Cases are always the final (and often skipped) phase of a project. Quick question on the Audio/Video 4 pole jack, which of the wiring standards have you gone with? I know from personal experience that there seem to me more variants of these cables than the permutations would deem possible! Can anyone confirm the size of the new fuse on the micro-USB input? I saw a comment on Reddit that it’s 2A now (was 1.1A on the regular Model B) but can’t find the “official” information anywhere. I think it is now 2A, but the entire power circuit is much better, so you can have up to 1.2A on the USB outputs (with a config change, standard 600mA). which does say it’s a 2A fuse. I kind of love hate it. I like that they’ve allegedly improved the USB hot plugging. Like the microUSB clicker. But now I have a stack of SD cards. Don’t like that they moved the composite. Wish they put in a new CPU and GPU. I feel sorry for all those that invested in SD cards, because now it is the MicroSD that apply. However, I have bought the MicroSD card with adapter in recent times, but we received a donation with 4 Raspberry Pi’s to CoderDojo Lund and they have the large secure digital cards. It is good that the MicroSD card doesn’t stand out because there was a risk with the old design that the plug was damaged during transport. It is a disadvantage that it is difficult to use composite video, but it was probably necessary to move the plug into the headphone jack to fit more GPIO ports. One hopes this plug follows an existing standard. While some cleaner audio circuitry sounds nice, I didn’t see any mention about the DAC. I take it that it’s effectively the same 11-(?) bit output as the original Pis? I’m currently using a HDMI converter box with VGA (unused) and audio outputs with my Pi-based music player. If the B+ can actually output comparable sound quality without needing an expensive HDMI breakout box it would be great because I could have music/internet radio all over the house. The DAC is now of sufficiently higher quality to warrant looking at improving the 11-bit performance. The VPU (DSP engine) in the Videocore block is more than capable of doing the cleverness required to improve the performance of the output bitstream to match up to the improved qualities of the DAC. Sorry, jdb, but I don’t know what any of that means. To rephrase my question, will the new improved audio part be of good enough quality that I can do without an expensive HDMI to analogue box? I don’t know if you’re a Foundation member, so I’d like to get an official response, if possible. Thanks. I still don’t understand the answer. Can someone translate it from gobbledegook to proper English, please? I think jdb is saying that previously (on the Model B) the interference from the power supply caused noise on the audio output which meant that there was no point trying to improve the quality of the DAC any further. But now that the audio circuitry has a much cleaner power supply (on the Model B+) it *is* worth looking at improving the DAC code again, because you’d now be able to tell the difference. But “warrant looking at” implies that this improved-DAC work hasn’t started yet? To answer your original question – I’m afraid I’ve got no idea how much “better” it will sound when/if this work is done. I guess all you can do is wait and see…? Great enhancements! Does the lower power consumption allow the B+ to run cooler? Also, does the new power circuit prevent USB backpower? I would have loved to see Audio In listed in the new features. I’ve already ordered a B+ this morning. Thank you Raspberry Pi Foundation! “Does the lower power consumption allow the B+ to run cooler?” Total power input is lower, so total energy converted to heat is also lower, but the SoC hasn’t changed, so the total energy used by it is still the same, so it still runs cool without the need for a fan, and the electronics around it are cooler. does the new power circuit prevent USB backpower? Yes it does! It also prevents the “rush-in-current” problem, that made you could not plug in USB devices without crashing the PI. In other words, the PI now supports hot plugging. And there is now a reasonable current limit for HDMI devices, so bus powered HDMI to VGA adapters are now officially endorsed. I would have loved to see Audio In listed in the new features. As the Broadcom SoC does not have analog inputs, that wasn’t addable, but you can use the I2S or SPI inputs to add a ADC or codex simply enough. Especially adding an “inter IC Sound” compatible “soundcard” should be easier than ever before now that bot I2S AND I2C are available on the same connector! I saw the announcement this morning and after reading about it for just five minutes I decided to buy one. I have the Model B rev 1 with only 256mb. I can’t wait. I only have one wish, something to plug in to the display connecter. Any hope? Well done! The improvements with the SD card is great! I´am running xbmc with a wifi dongle ( Not the most advanced stuff) BUT it´s the best and price worthy media player! As for the combined audio/video, there’s a fun little thing I discovered, using omxplayer output video & audio to hdmi, whilst using mplayer output to the audio jack I had. About the cases – I would make it clear what fits and what doesn’t, I can very easily imagine being a new user and thinking, B is pretttyyyy close to B+, it’ll probably fit. Raspberry Pi team – Congrats. A wonderful addition to the Pi family. I love the fact that it’s lower power, that’s always a plus. The CPU is fine for my needs, and so is memory. Also , great to hear that the SD is being replaced with a MicroSD. In the cases I’ve built, the blooming’ SD card was always annoying me, and the low-profile adapters were usually too thick for my liking. Well Done, I look forward to future projects using the B+!!! *I* look forward to your future projects, Dave – it’s going to be great seeing what you get up to with it! You’ve gotta be kidding me. Element14 wants to charge me 69 + shipping. I’m in Mexico. Also it says that it is out of stock. Extra USB ports come in handy. Let’s hope the next version is an armv7 (for those of us who like that bit more power and don’t mind the extra power usage) with gigabit Ethernet. This is awesome news. I’m really excited about the audio improvement, but it looks like I’ll have to wait a little while to play with this here in Argentina. Shipping takes forever. Thanks Greg! Unfortunately MCM doesn’t ship to Mexico. I’ll be visiting the US in about 40 days, I hope they’ll have some in stock then. Could we get a pict of the belly (underside) of the beast posted as well? Other than that – Great job guys! Hello, I wrote one brief review in portuguese! Congratulations – These are great improvements for Raspberry Pi board! Congratulations for your work. These were great modifications and improvements for Raspberry Pi. Bummer…. I just bought a Model B a couple days ago. The ethernet port is Gigabit? Nope, 10/100 the same as the Model B. This is a nice refresh, but please understand that a lot of people were hoping for an improvement to CPU, RAM, or both – even if this necessitates a higher price point. Highly compatible SoCs appear to be available so it’s frustrating to see the Pi get stuck down this particular technological cul-de-sac. The “fanboy” response will of course be “if you don’t like it, go somewhere else”. Unfortunately for the Foundation that is exactly what some people will now be doing and that is a huge shame. I am not a fanBoy but have great respect for the RPF and selling approaching 4 million, so a few people sell them and leave, well so what, choice is LIFE. The more of everything is blurted out at every opportunity, but if the people who ask for more actually realised what the cost in resources is they would keep quiet. Also the RPF is about Education and the B & B+ fit the requirements of the UK ITC Education. Well this was sure awesome and unexpected news to find waiting for me this morning. Absolutely love the upgrades. the 4-port usb is a great addition and the micro SD is just what was needed to refine the form factor and greatly improve the aesthetics. This does just about everything I wanted to do with the CM before learning that was pretty much out of my reach so my feelings are running from gleeful excitement to guilty shame over my brief disappointment when I thought you all had back burnered us model B developers. I’ll never doubt you again!!! How long before you double the amount of ram in this shafting early adopters again? Hmm, nice post Captain Furniture polish. Had you bothered to look stuff up, you would know that there are no 1GB RAM chips available for the SoC. So, the answer to your questions is never. BUT, because its you, if you send me your Pi, I’ll Tippex 1GB on to the RAM chip if it makes you feel better. I presume you are referring to the increase in RAM size from 256 to 512 (at no extra cost), fairly early on? I have a 256MB Model B, works fine. I got what I paid for. Never felt shafted at all. So I suggest not looking gift horses in the mouth, as it leads to ribbing and sarcasm. Oh man, my Model B arrived on the same day the Model B+ comes available. Pretty unlucky timing for purchasing a Raspberry Pi. I am about to Kickstart a project using R. Pi’s. This helps with some of the issues I was having. interesting development. I am pleased. Please add a SATA port. Will there be a Raspberry Pi A+ ? Would have really appreciated some more RAM and a power button, but there are no ends to expectations anyway. However this looks like a massive improvement indeed. Absolutely love the upgrades. the 4-port usb is a great addition and the micro SD and it location is just what was needed to refine the form factor and greatly improve the aesthetics. If I want to move from a model B to B+ can I just clone my existing SD card to a microSD card and expect everything to continue to work correctly? Yep, as long as you’re using up-to-date firmware and kernel. 4x USB is nice, power efficiency also nice! Same price, even better. I’m not disappointed at all, because I wasn’t expecting anything (except maybe an improvement in USB hotplugging, which I gather has now been done.) Eben had made it clear in interviews they wouldn’t be changing the SoC for some time (years) to preserve the existing investment in SW development. I’m feeling pretty good about this too. When I see people moaning about wanting a performance upgrade my thoughts are that they obviously do not want a Raspberry Pi and/or they should learn to write more efficient code. If you want more performance then Learn Assembler! I see that the B+ supports PWM pins. Can they be used as analog pins like the Arduino has? If not, will the Raspberry Pi platform ever support analog pins or is it a limitation of the SoC used? Do you mean analogue input or analogue output? Analog input pins. I want to be able to read values from analog sensors like photoresistors. The SoC has no analog input pins, so you’d need additional external hardware to support analog input. Many options exist for add-on boards to do that. PWM is used to create an approximate analog output on a digital pin. The processor supports two hardware PWM channels. In the case of the model A&B GPIO 18 can be used for PWM0. I believe that the B+ adds PWM1 on GPIO19. These are hardware based PWM signals. The advantage of these is that they don’t add any additional load to the processor. Alternatively any GPIO port can be used as a software based PWM and you can have as many as you want, but there is a performance hit. I believe this is how most people are using PWM today and is the only method currently supported by RPi.GPIO. There is no analog input for the Raspberry Pi, but it is possible to use an ADC IC / add-on board which can be done using I2C to interface with the GPIO. This is not as flexible as the Arduino, but this is a completely different board. The Raspberry Pi is complete “computer” with digital only on the processor, whereas the Arduino has better handling of different input / outputs, but does not run a full operating system as the Pi does. Great work with the B+! Quick question: amongst the added GPIO pins on this board, does any of them double as a PWM pin? As mentioned further up, wolfson cards are gonna be fun to mod! Are bull brand tins the exact same size as altoid tins i wonder… will check that tomorrow. I knew about chip change and some ‘optimisation’ on the standard B about a week ago, so yesterdays leak was quite a shock. Wolfson already announced they would redesign a “+” version of their audio card for the model B+. Hi, the old revision of Raspberry PI B remain on the market? We have a large production project based on this version and rebuild our PCB is really difficult. Yes, it will – that’s mentioned in the video and in the blog post you’re replying to here. Amazing update to an amazing British product. I am ordering mine now. Can I just ask why every presentation I have seen so far anounces the price in dollars! Let us not forget that this is a British achivement and we should wave the flag for the Raspberry PI foundation. It took a while to read through that lot! really looking like a mature product now. Nice going but I have some concerns with RFI , especially as I use the Pi for High Altitude Balloon (when I get a job)and Amature Radio use*. As an engineering tech that worked with switching supplies,I am aware of possible radio frequency interface. I hope the new design will not interfere on amature radio and GPS bands. I wonder if I am correct there still no audio input jack. This is another issue with me. * While unemployed I playing with the pi and got it to run as a standalone APRS (beacon and Igate) unit or a networked APRS TNC for to my Windows PC. Help refresh and learn Linux skills for work I am seeking. But FYI, its much harder to search the internet for “model b+” than “model c”. If customers search for “sd card raspberry pi model b+” they’ll probably get results that are more appropriate for the model b. Great to see the B+. I’ve got a B running Robot Operating System (ROS Hydro) using a USB hub and an Arduino to handle the I/O. Works ok however it’s a bit short of computing power. Any chance of a faster processor in the B++? Is there a second UART available in B+? That’s one of the things which Pi was lacking the most. You can probably use an I2C/SPI to UART chip like the SC16IS750 to add one or more UART (serial) ports, but off course you also need to have drivers for the SC16IS750 . Great to see the B+, a great upgrade with lots of potential. I’ve got a B running Robot Operating System (ROS Hydro) using a USB hub and an Arduino to handle the I/O. Works well however it’s a bit short of computing power to run any serious navigation or perception packages. Any chance of a faster processor in the B++? Thank you very much for not changing the system entirely – it is extremely important that you do not so much hardware forks. Waiting for my B+ to arrive and then I’ll modify my (already modified) Punnet. Current one has ports for the camera and the GPIO as well as having the GPIO pins identified on the top. I’ll update when I finish the Model B+ version. Congratulations on the release of another great product. This update to the Raspberry Pi appears to be well thought out, and very useful. Again, don’t take to heart the detractors who will try and pummel you for everything you do that doesn’t involve SATA/1GbE/1GBDDR, you have a good handle on what the Pi is to the community and are doing a great job. How do you use the ID EEPROM and can you boot from them? what do the RUN pins do? Uhm, they’re £26-30 – how is that cheaper? You released the new version… The B+. Eventually, you will release a future version … the Raspberey Pi 2. Instead, You could advertise it as being a new “revolutionary” hardware device and call it the Raspberry 2 Pi , since tthere are 2 Pi radians per revolution. For anybody interested we have crated a 3d model of the new Pi. Step file available here http://www.inti-innovations.co.uk/products/inti-media/inti-media-raspberrypi.html (documentation and downloads section). Congratulations Rasp Pi team on what looks like a very logical re-imagining of the original model B.
Don’t be disheartened by the angst I see in some of the comments. I think there is a bit of a love hate kinda vibe going on in response to the incremental rather than monumental improvements. Take it as a complement, as it shows how much people love the Raspberry Pi. Maybe to the point we feel we have a personal investment in it. Obviously there is allot of pent up demand for something more powerful. I’m feeling it too. Im sure this is a good sign for the future. A neat tidying up job on what was already a very successful product – thank you! I will certainly buy one (as soon as there’s a case I like) for my NAS server – I’ll be able to dispense with the hub, which has been a rectal discomfort, and tidy up the wiring considerably. Hey all, apologies if this question has already been answered elsewhere, but how good is the audio? I’ve seen talk about 11-bit, but what’s the sampling rate? Furthermore is the Pi compatible with external DAC’s / ADC’s? There are several external ADC and/or DAC boards for data acquisition. For high quality audio, there is the Wolfson Audio board using the I2S interface, but until now it has been designed for Port 5 on the R-Pi Model B (rev.2) and not the RPi B+ which has removed P5 in exchange for an expanded P1. Wolffson has announced a version for the Raspberry PI model B+ already. Even though for many people the redesigned audio (A/V) jack output will now suffice better than the old one (but if “better” is good enough is obviously a personal choice). Just: temporary jumper wires AND kernel patch needed. There are some cheap hdmi -> hdmi+audio (spdif/analog) and hdmi->dsub+audio devices on ebay that can be a good alternative for that. Those devices requires no driver, because they are using hdmi audio. Is it just me, or are some of the GPIO pins quite bent over in this product photo from MCM Electronics? Or with photo shop, as this picture obviously will not be representative for the pin-headers of the delivered devices. Does anybody know how to shrink the size of an SD card image? I have a couple of spare 8 GB micro-sd cards, but apparently they’re slightly smaller than the regular SD cards and I can’t write the image. The essense of good design is in knowing what to leave out. Ha, just bought a Pi last week. Still, it suits my purpose just fine and I don’t consider it obsolete (not by a long shot), although I’m a bit envious the lower power consumption of the B+. Then again, my fourth Pi will be a B+. Great job. To the Raspberry pi Creators, Developers, Testers I say THANK YOU! Thanks to you my girls feel empowered to learn all they can about the power of a ones imagination mixed with technology. Who knew $35 could change someones life instantly. All the best and looking forward to the future. I would have a loved a revision on the lines of hardkernel’s Odroid-U3. Agreed it is priced higher ($90 including shipping). I wonder if that was the reason for not going for Quad core, 2GB RAM kind of specs. Er, yes. Clearly. Price point is vital. You cannot build a quad core 2GB RAM device for $35. $90 is nearly three times the cost of the current Model B. Awesome upgrade from the Raspberry Pi Foundation. Worked extensively with the Raspberry Pi Model B and was awestruck by it’s versatility. Hope the B+ upgrade shall be a success in many ways! Is it possible to supply more than 5V? I have a 12V regulator, used to power other devices. Now, model B+ has a switching power supply, can I supply 12V? No, max is about 5.25 IIRC. Can I run four external drives on this? Or tree and a USB dongle for wifi? There is about 1.2 Ampere available for the four USB ports (with a line in config.txt) which seems not enough to directly power FOUR hard disks, but if you externally power the hard-disks it shouln’t be a problem. The B+ now also solves the back-feeding issue, so you do not have to worry about that (but power distribution from one HD to the next might be a new issue with multiple simultaneously externally powered HD’s, if they all try to put power on the USB bus, but that isn’t a PI specific problem. Does B+ support microphone port ? No the SoC has not changed, and it doesn’t support any audio input hardware. You can add an audio input by adding your own I2S (Inter IC Sound) audio codec through I2S signals now available on the 40-pole GPIO header. Wolffson has announced they will release a B+ version of their “audio card”, which supports multiple microphones, and microphone inputs. Or you can add a USB sound card with a microphone input. I guess the 3.5mm jack is 4 pole now. Is the pinout Right Audio, Left Audio, Video and Ground, counting from the tip. I got 0 out of 4 correct. Maybe I should stop playing the lottery. You got 2 out of 4 correct, only switched the tip and the ring (left and right). I really like the new, more efficient use of power. I want to use a Pi to monitor my cabin, and as a 24-hour load on my very small solar installation, this small improvement in efficiency will be a big help. I didn’t need another Pi, but better power and 4 USB ports just convinced me to buy 3 more. Will the Secondary Memory Interface be available on the new GPIO connector? Thank you. I know about the documentation and that is the most important news for me. I hope it will be announced in a blog post. That said, a secondary memory interface does NOT mean the RAM can be expanded beyond the current maximum of 512MB ! Instead, if it will ever be implemented it will become a secondary memory device with far faster access than either SD-Card, or USB memory. This means it can be used as a kind of very fast virtual memory (dedicated memory swap device). What this means in practice has to be seen, but for any hardware implementation it has to be noted that almost all GPIO pins will be used to connect the actual memory chip(s). It will mean that some trickery will be needed when this “SIDE RAM” (to keep the tradition of using BBC computer related terms) needs to be combined with any use of the GPIO’s. I’m sure something smart can be developed. For now we just have to wait and see how this plays out. Actually the new EEPROM mechanism, are intended for future “stackable expansion modules” called “HAT’s”, (comparable with Arduino shields, but made stackable) . Each stackable expansion module can announce with its EEPROM which if the various I/O subsystems of the GPIO header it will use. So the PI can combine the I/O of those various modules. At this moment the details are still very vague, but in the near future we will probably hear more. Will the B+ still reboot like the B does when you’re switching around hard drives? No, the B+ PI now has hot plug support, so you can now plug in a USB device after bootup. *LOL* I’d always thought this was a bug… never occurred to me it was just a lack of hot swap support *head desk*. WooHoo to the new hot plug support. That’s my new favourite thing. lack of hotplug was a “bug” introduced with the loss of polyfuses after rev1. Now we have hotplug support back with B+, and no powering problems either. B+ Arrived this morning. Quick question … will the micro sd slot support a 64gb card? Only the card connector itself has changed, so it will support the same types of cards the model B does (if they mechanically fit, obviously). Anyway: I wrote my rant, I feel better and I’m still happy the Pi exists and to own one. How can you discount something that is already discounted as cheap as it will go? It’s making sure all stock gets sold that is one of the main reason behind keeping quiet about new product launches, sorry, but that’s just the way it is. It happens with everything. I have no objection to the Pi’s price – I’m actually amazed by it! My mention of a discount was a preemptive reply to the natural objection that announcing the B+ model would have hurt current stocks and discounts are the common countermeasure to that. My complaint is that resellers came before users, which is nothing new but still not pleasant at all, especially considering that – like the blog post mentions – demand for the original model will still exist for hardware consistency reasons. Finally, it doesn’t happen with everthing. Even revisions of gaming consoles and high-end smartphones are announced a week to a month in advance – and we’re talking about some big sharks here, not charities. 0 days is new to me. All in all, I stated my case and I am still disappointed, you rightfully stand by your decision and I thank you for your reply. And I guess the “big sharks” make much more profit per unit, and thus they have more “headroom” with which they can offer discounts. Sure, I do prefer there to be an announcement, so that I can decide whether to wait for the new, better model or get the previous one anyway (often for a discount). Inevitably someone will still make their purchase just before the announcement and will not have a chance to choose, but like I said before, going straight from complete silence to release is quite extreme and strikes me as very consumer-hostile, something I wouldn’t expect from a charity. I think, because they are a charity (and cannot afford to lose money), and there is no room to discount old product (prices are already as low as possible), this is exactly the right mechanism to use. Given the previous two point, if the B+ was announced 6 months ago (when the first boards were prototyped), there would be few if any sales of the B for those months, any B’s in the supply chain would likely need to be crushed as no-one would buy them, or if sold would probably be sold at a loss. A charity cannot afford that. Read up on the Osbourne effect. Announcing early killed that company. most people find that they need a second one anyway as a development board at on the test bench, and their second purchase out in the field actually doing stuff without extricating it from whatever mounting. the B is virtually identical from a coding point of view, and when you are ready to commit it to use in a robot, or remote webcam or hydroponics monitor or whatever, a low power model A+ ( impending** ) is ideal. I’m afraid I didn’t really get your point. Will it be possible to turn power to the USB ports off? I am having problems with a USB GSM modem and the only way to reset it is to turn it off and on again. Or was this already possible on the normal model B also? No power to the USB ports is hard wired, but unlike the older models you now can safely remove and re-plug USB devices. vthielen wrote:Will it be possible to turn power to the USB ports off? I am having problems with a USB GSM modem and the only way to reset it is to turn it off and on again? I think this is not possible on the normal model B? The 9514 hub’s power control is hooked up to the USB power switch. Sending a control message via USB can power it off/on. I wonder if you could cut off everything to the right of the mounting holes (USB and ethernet) for a mini-Pi (or maybe the A+). Would not do that (sawing off part of the board), with a many-layer board as the PI, chances are big you will creat internal shorts. Also because its more cost efficient to use an identical PCB for the (announced) Model A+ and the Model B+ I do not expect the PCB of the model A+ to have any “experimenters areas”. Also the B+ PCB should be final at this stage. Something I didn’t see mentioned in any of the videos or descriptions above – did some of the status LEDs disappear? They’re labeled ACT, PWR, FDX, LINK and 100 on the Model B. I see ACT and PWR in the upper-left corner in the picture of the B+, but that’s it. Not that I’ve ever paid that much attention to the LEDs, but I’ve seen them referenced in debugging steps. This explains why my local computer shop dropped the price on model B’s about three weeks ago from USD$39.95 to USD$29.95 as well as various cases. I like the extra USB ports as two can be problematic without an external hub. At the moment, I have enough B’s to keep myself amused but my next purchase will most likely be a B+. Actually, the reason that happened is much more likely to be to do with currency fluctuations; nobody was discounting ahead of time because of B+. Do the new raspberry work with less temperature? AFAIK the RPF is technically split into an “engineering half” (e.g. http://www.raspberrypi.org/products/ ) and an “education half” (e.g. http://www.raspberrypi.org/resources/ and http://www.raspberrypi.org/picademy/ ). Ooh, had to get my smelling-salts out when I read this! Oh, yeah! WAAAANTTT (Will order once dole cashes). Is the new Model B+ card available in a 3D-format (with components) for example as a STL-file. To simplify import into 3D-CAD programs when designing cases, etc. Didn’t bother reading the comments? 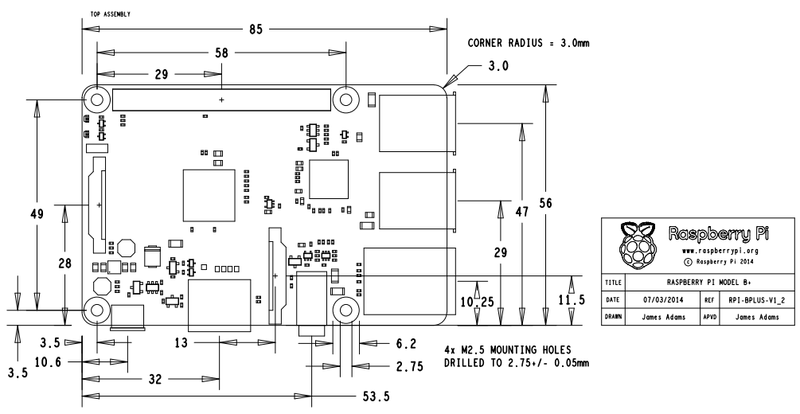 Can you PLEASE mark the precise location of the 40-pin header on the mechanical drawing…maybe the co-ordinates of the PIN 1 pad? hi, does the model B+ still have the crappy one single lane on the DSI/LVDS (Display Serial Interface)? so you still can not connect an LCD Display directly to it – because todays lcd Panels are using Minimum 2 and more common using 4 lanes. unbelevable, that it was forgotten to connect all four existing lanes of the PI to the connector – so the Interface is in fact not usable for anything. oops, shame on me. i forfot to tell, that on the other Hand i very like the new model B+. …or *PERHAPS* there’s something in the works for that interface. I guess we’ll just never know. 1x RPi Model B rev.2 (512MB) ??? How are you asking for the revision 2? i thought, someone absolutely Needs the “old” form factor/layout more than me – even the old Rpi have less Features. DRB: where is your school… is it in germany? is 1/2 for the rev1 and 2/3 for a rev2 of the original price too exorbitant and rude??? I don’t think the education community which the Foundation was originally targeting gives a hoot about most of what these comments on either side are ranting on about. It seems that the whole initiative has now been hijacked by hobbyists and fanboys who are just looking for a small and cheap computer on which they can base their next project. Let’s get back to what’s important please – educating kids in computing. This is just awesome news. The amazing little RPi just gets better. I just have to shake my now-greying head at some of these comments. It’s a $35 computer people. It’s a gift to the world. Somewhere right now there is an incredibly gifted child who otherwise couldn’t afford a computer with a RPi. That child is going to grow up and do something that will change life as we know it. He/she doesn’t care about a SATA chip or dual core. That child is just happy that he or she has a computer at all. That’s what the RPi is all about. Thanks to the Foundation. I know that this was a lot of hard work and I’m really looking forward to adding another pi to my collection. Great work people! +1 wholeheartedly agree, though I am often abused for taking the stance that a Pi is adequate as is.. Yes I am now a B+ owner and the evolution is fantastico ! I agree — I was that kid about 30 years ago. Too bad PCs were ridiculously expensive back then. I was introduced to a Commodore 64 when I was 7, and I wanted nothing more than to have hours alone with that machine to write BASIC programs. I guess I’m a born programmer. But I had to wait until I was *15* to get any kind of access to a computer. It was a long wait! I would have loved to have an option like the Pi. I would have sold lemonade for a month to get the $40. Mine arrived this morning, and I’m now in the process of setting it up. It both looks and feels incredibly well refined, and the build quality is perhaps the best I’ve seen to date. I can’t recall how many variations of the model B I’ve experienced (and later recycled to friends) but I’m pretty certain I’ve seen each of the major Model B revisions. This is a massive step up from the latest model B, and an even greater step up from the older 256MB variate if you’re still using one. If you’re looking for a significant upgrade, this is it. Ignore the nasty detractors! I am a teacher who has used the Pi (A and B) with Scrtach and then Python to bring propgramming to a whole school full of kids. My own boys use it and I will be laying hands on a B+ as soon as I can. You guys do FANTASTIC work and those who whinge about not having this and that should fire up the soldering iron and do it themselves. Very Nice!!! Can’t wait to clean up all the wires needed for an external USB hub. Also can’t wait for the Pibow Timber case, love mine on the Model B.
I tried to test and buy the PI from your distributor , Element14 , here in Delhi (India). Their support was totally dis-satisfactory . I just couldn’t proceed with my initiative of providing ‘e-classes’ to large number of schools . Looking Great!! !…Now I have no need to purchase a USB hub and can interface more sensors with GPIO’s. I’m very interested to integrate this card in a demonstrator for a project (to be deployed in my customers homes) but I would like to know if there are any qualification certificate/reports available (CE mark, electrical security, etc)? Or qualif planned to be passed? Mine came from RS with a ***Statement of Conformity*** attached to the paperwork.. Thanks but I dont think this is what I need. We don’t share those; you should be able to demonstrate that the device is CE marked, but it’s the legal responsibility of any company making a product with Raspberry Pi inside to do their own CE/FCC testing on their entire product. Of course, we’ll do our own certification for the global product but we would have less tests to pass if we could have Raspberry CE test reports… Why don’t you share these docs? they are a proof of good job! I’m not sure that having the Raspberry CE reports would reduce the number of test you have to do yourself. Since enclosures and peripherals can make such a large difference, don’t you have to do all the required tests anyway? I have read may postings on the new Model B+ and have been interested on some of the comments. I have had my New Model B+ now for just over a day and feel that some of the comments made by people who don’t have one should read my actual findings. The new switch mode power supply is much better on the 3.3V – it bounces less and does give some more output current. The 5V rail is still very much an issue – the supply still goes through a polyfuse which increase its resistance with current follow. Switching 2 small relays, keyboard, mouse sees the 5V rail dropping to 4.6V, this can be overcome by the usual shorting out of the polyfuse. The new audio & video connector is very nice but if you plug a set of headphones, speakers etc without using a special lead you short out the composite video signal -outch! The new MicroSD slot is great and very reliable – I’ve repeatedly tested the latching which on some connectors can be week and not hold the card correctly. I have tested a lot of different add on cards and all worked perfectly. I have read some people complaining that the extra pins on the new GPIO connector will stop them plugging in things – not the case unless you are using a cheap IDC ribbon cable with extra large retaining clips. Overall this updated model from what I have experienced is far better than the previous models. No “outch”, shorting out the Video output when using a stereo jack plug was full foreseen in the design, and has no detrimental effect at all. and the new polyfuse is now 2Amp instead of the old 1.1Amp one, but you should feed relays from their own external power supply, just as always. For normal USB devices the new polyfuse should not be a deterrent. The polyfuse being 2A does not get past the fact that is a polyfuse which has resistance, and hence volt drop. The only difference with the new 2A is the rate of change. The 2 relays in question where used as load, each taking 54mA. The power supply attached was a 5V 4A calibrated supply which takes it out of the equation. Theoretically off-course you are absolutely right that a polyfuse -must- have a resistance to work, but normally this resistance is so low that at currents below the tripping point the voltage drop will be negligible! Your comment about “the usual shorting out of the polyfuse.” is far from reasonable, its a very rare occasion that the polyfuse “must be shorted”! In fact the only time I have hear of such a thing being needed was when the polyfuse was broken (perhaps by being triggered very many times). And also in the time that each USB ports still had its own, (very low rated) polyfuse, but that is the reason why they were later removed. In fact I have researched which polyfuse has been used in the B+, and came to the conclusion it is the 1812 sized 2.0A hold current BOURNS MF-MSMF200, which according to it’s datasheet has an -maximal- internal resistance at 25 degrees Celsius of just 0.080 Ohm (and a minimal internal resistance of just 0.02 Ohms) Other brands will by nature will have a very similar resistances. According to you the voltage behind the polyfuse drops to 4.6V, at which point by the way, the new brownout detection circuit of the B+ would turn off the PWR LED, but that is besides the point. The point is that this means that if the polyfuse is the only cause the polyfuse must have a 5.0 – 4.6 = 0.4 Volt drop across it! But this logically means that according to ohms law the -minimal- current that must flow through it to cause a 0.4V drop must be I = V / R = 0.4V/0.08 Ohm = 5 Amperes! Thus this is clearly impossible! The only reason you can see a 0.4V drop appearing on the PI is that somewhere there is a much larger resistance between the PSU and the PI than the polyfuse’s 0.08 Ohm. I can estimate that resistance value, as you have supplied a rough indication of the current consumption. I’m guessing the B+ PI uses roughly 500mA (maybe a bit less), each USB mouse/keyboard device uses a maximum of one hundred mA, but most often its half that or 0.1A (100mA) together. And both relays together use (when both turned on) 2 x 0.054A = 0.11A (110mA) and the HDMI port uses another maximal 50mA, so the total current consumption will maximally be 500+100+110+50 = 760mA, that means that the 0.4V drop must be caused by a resistance of about R = V / I = 0.4/0.76 = 0.53 Ohm! its well known that below par microUSB cables can have several fractions of an ohm resistance, it appears you might use a terribly bad one. I understand that upgrading the Pi to Dual-core, etc. would require a whole new design, and render much of the Foundation’s work up till now useless. HOWEVER, what about upgrading to 1 GB of RAM? That would vastly improve the “budget PC” experience of the Pi, and it would be completely backwards-compatible. I suppose the question is, does such a System-on-Chip exist? There are no 1GB compatible RAM chips available, so effectively impossible. The main reason why a massive performance upgrade is unwanted is because in all probability it would mean that all new software developments would be done with the new performance in mind, and that would leave all the millions of previous PI owners in the cold, as they would not be able to use such software. So they all would be forced to upgrade! This may be a good policy for a commercial company, but not for a foundation like the RPF, that wants their users to have many years of profit from their PI’s without being forced to upgrade. If this was going to happen it would have happened with the original 256MB Pi, but I haven’t seen any sign yet that users of those (I still have one myself) are being forced to upgrade by writers / producers shutting out the 256MB Pi. However, since I also own a 512MB model I’m bound to say that the performance of the 512 model is considerably better for things which involve using it as a desktop PC – so if a 1GB version magically appeared (and I know there is no such SOC-TOP Ram available, so this is purely hypothetical) then I would not grumble too much about the opportunity to add a 1GB Pi to my collection. Great job. This looks like the “what-we-could-have-done-with-an-unlimited-development-budget-and-an-infinite-amount-of-volunteer-time” edition. Looks very spiffy and some very useful tweaks. Thanks. 0,5-1W just only replacing linear regulators!? If power consumption will be less 1W it would be great. By the way, would it be a way to “disable” sameway video output to further reduce power? The GPU already auto-magically turns off parts of itself when they are not needed, that is why, for example, playing full HD video’s slightly increases power consumption. In a few months time a Plus version of the model A will be released, identical to the B+ but with the same stuff removed as the model A, so without the LAN9514 chips, but with the new switching power supplies. The A+ will be the model for people who need very low current consumption. B+ is passing, but I need an A… Seriously, where can you get a model A in the US? Should be a new production run of A’s soon – all manufacturing capacity has been on the B+ in recent weeks since demand for that is so much higher. Once the demand has dropped to sane levels, then A production can be restarted. Will that be A or A+? The original A still has the advantage of back-powering from the USB. For stripped-down projects that is very convenient. Beautiful… Still no thoughts on upgrading to gigabit ethernet yet? That too would require a new SoC. Hooray: 4 USB ports. It will stop having to choose what to plug in / using a hub quite so often. It looks like the only reasons for going for a B now are that a B+ won’t physically fit in something or you have a pile of SD cards because.. The change I would have liked to have seen was the ability to plug in a VGA monitor. There are an awful lot of VGA monitors out there that can’t do DVI and the Gameduino shield for the Arduino shows it’s not hard to do VGA at a fixed resolution and frequency. Hmm: obviously too much could not have changed if it is still to be a ‘B’. But it’s interesting to see so many ‘but it couldn’t have been an ARM7-based SoC’ posters use the because of how much work has been done on ARM6‘ arguments. As at least one person has said, it’s inevitable that a future Pi will go ARM7, and that work will become ‘legacy’ before too long. The current Broadcom SoC cannot, and never has been able to support VGA output signals, so to create VGA signals a HDMI to VGA converter would have to be built in, and it would have increased cost and power consumption of the PI to similar levels as for people who now use an external HDMI to VGA adapter, but for everybody! It already was quite easy to use a HDMI to VGA adapter, although using many different models makes it a bit more difficult to find the right settings (if any were needed). One of the improvements of the model B+ is that the need to use an externally powered VGA adapter has been removed! So you can now use the more cheaper HDMI powered models, which means no more extra cabling and supplies! Its possible the swag shop will start to sell an “official” HDMI to VGA adapter, now the use of HDMI powered models has been officially endorsed. And with just one universal model setting it up will become much easier, especially if they manage to find a cheap model that does not need any manual setup! Actually ARMv8-64 is more than likely for next generation Pi, ARMv7 is getting old so if the RPF had changed at this point, then would have to change again in 2 years or so, what a waste of time, money and resources. Also the price point and choice of SoC’s is more favourable now than it was five or so years ago and in real terms will get cheaper. I wish people would think about the future before pulling ideas out of the air and jumping on a meaningless band wagon. Regards VGA, well Dvi has been on monitors for a decade or so and digital is easier than analogue to implement in boards considering the price point. Last but not least I do have B+ and the silly USB Hub back powering has gone which is great. The transformation compared to my first Pi bought 2 years ago is absolutely amazing and can not wait for Maynard to give it the final polish ! Both converters are based on the IC U3. Most often pin-20 is blocked, but on the Model B+ PI, pin-20 happens to be one of the GND pin’s so potentially you do not need it and you can cut it off with a side cutter. I have no trouble using an external USB hub, which can also provide power if needed, so two extra USB ports will not do much for me. (By the way are they native or is there a USB hub on the board? More native USB connections could improve speed, a hub does not.) For me personally two Ethernet connections would be more useful. In my humble opinion the switched regulators should have been there from the beginning, why waste power and generate heat by using old LDO regulators? Regarding power I would really, really like a normal power socket, that would tolerate a wider span of input voltage. Why not something like the Olimex Duino series? Having support for a rechargeable battery would give a simple UPS functionality. Actually there is at least one good reason to use linear regulators rather than switching regulators on equipment, and that is to minimise the amount of broad-band RF noise that the unit generates. Switched – mode power supplies are generally a nuisance to HF / Shortwave reception, so anyone using a Pi in conjunction with an HF radio receiver (for ham radio purposes, etc) might very well find that the old ‘B’ is still a better board for that purpose. Could have, but not at the crucial price point. Not everyone needs wifi, and if they do – they can use one of the four USB ports for a wifi dongle. Also, you could say that about any feature. What’s important to you is not necessarily important to others. Our focus is on education. Very exciting! I have a the Model B Revision 2 and I just might pick this one up because of the 14 Extra GPIO Pins and the Micro SD Slot! Are the B+ models made in the UK? I hope you are being sarcastic…. Will Model B+ be released by Egoman of China? Many thanks. Right now there isn’t any photo of the Raspberry Pi B+ in Wikimedia Commons to use in the wikipedia’s articles. Is the first image in this article licensed as CC BY-SA so I can upload and use it? How about a T-shirt with just a photo of the B+ or the track lay-out and silk-screen on? That would be cool as it would make the wearer look like a robot. Bit of a disappointment if i’am honest. It feels like a massive waste of resources with little improvement to the core of the unit whilst ignoring the main issue with the PI. Its time to move on, the raspberry Pi is old old tech. All you had to do is change the cpu to dual core to keep the product with the times. The improvements to the “audio noise” surely will only apply to those who dont use the digital HDMI output. The microSD change is welcomed, but without changes to the CPU, it just feels a waste of production runs. Dual Core + USB3 + Gigabit Ethernet = job done. 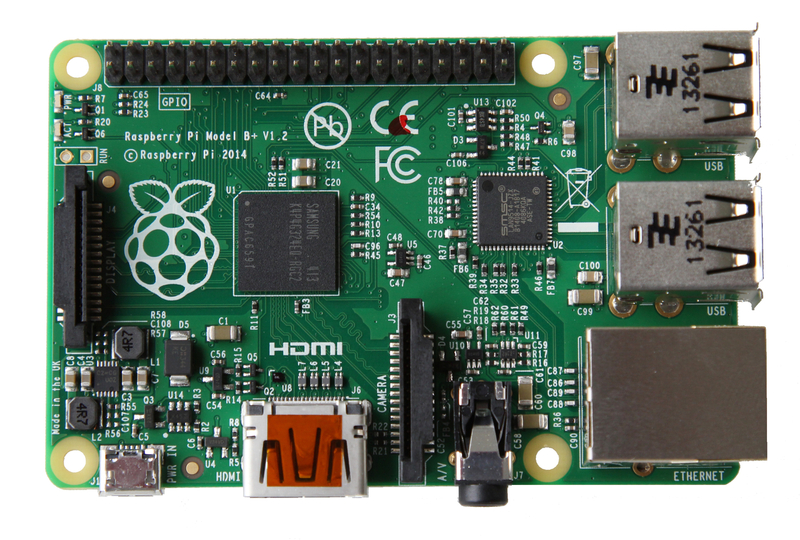 Say hello to Raspberry Pi 2.0. Thats what we crave, please make it and let this old and great product rest in peace. 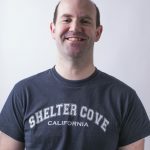 Eben Upton, Founder, has stated in public that he would expect a NEW board between two and three years from now (Sept 2013). In all likelihood,this would be a device with a new SoC with more power and more memory, and perhaps other features yet to be decided. I (personal opinion) expect that the upgrade path to any new device will be simple, and code will be compatible between devices, to ensure smooth transitions to any new device. In the meantime, there will continue to be new revisions of the current device (same SoC) as and when they are required and are cost effective. Again, there will be no compatibility issues between device revisions. The Foundation are putting a lot of money in to optimising code to run on the Raspberry Pi, both at the graphics level (Weston/Wayland and others) and the apps level (Scratch and others), which will ensure the device remains competitive over its lifetime. recent predictions place the PI II somewhere in 2017. As for "a massive waste of resources with little improvement", and "Thats what we crave" I could not disagree more, this update was exactly what was needed for the raspberry PI, the improvements are enormous, and do not make all the old Raspberry PI's obsolete overnight, which is probably the most important point. If you want a "Dual Core + USB3 + Gigabit Ethernet" system, you can buy that now, but it won't be a PI, and you can expect to spend a lot more than $35 for it. its not in the best interest for the RPF's goal to throw away two years of development of a system meant for computer education (and anger three million current PI users) by making it obsolete. Never say never – some of these simple improvements were publicly dismissed in the forum by certain individuals speaking on behalf of the foundation. The need to clear old stock requires the foundation to keep forthcomming hardware releases under wraps. The pi created a market and now has competition. I anticipate further hardware releases. It’s a computer for the price of an Ethernet adapter. It does what it was designed to do and way more. Your disappointment is misdirected. – The Model B does exactly the same as the model B+, so why upgrade? – why burn a whole new fabrication process and resources on adding 2 more usb ports. Especially when the majority already use a USB hub for their Pi’s? – Why should a Model B user upgrade to a B+? Only the “die hard” Pi fans will. Everyone else (eg: me) are waiting for a more valid reason to upgrade. I respect what the foundation has already done with the Pi from day one. But if they want to reach and replenish their current market, its time to “move on” and stop rehashing old equipment. Stick a Dual Core chip on the current Pi board. Then i’ll gladly buy more Pi. Because it doesn’t do the same. They shouldn’t unless they want or need to. And yet you don’t seem to understand what they are trying to do. Those two extra usb ports make all the difference. Scarecrows are now involved in fabrication design and implementation? Clearly, not meet their customers demands, ignoring the vast requests for a Pi 2.0. Make it work by spending less time on a rehashed B+, which in my opinion isnt worth the investment based on the same ARM cpu that desperately needs leaving alone? Disappointed, yes, hence my annoyed posts. So much potential for the Pi 2.0, yet simply ignored by the foundation for side products to dwell on old tech. Hmm. You may be disappointed, but the sales suggest that most people are not. You really really need to actually think about this a bit more. Just because what you want isn’t what is for sale, doesn’t meant that what is for sale isn’t the right thing overall. You have basically fallen in to the same erroneous mindset of all the other ‘needs to be better’ posters. They also clearly have not given this enough thought, whereas the Foundation has thought about it. The point being, right now, it doesn’t need dual or quad cores, it doesn’t need 1GB RAM, it doesn’t need gig ethernet. I am having an issue getting my B+ to boot from a 16GB Sandisk Ultra Plus micro-SDHC. Is anyone aware of a size limitation on the micro-sd card? Are you using the newest firmware? Trying to use noobs 1.3.9 Freshly downloaded. Does this mean that you can no longer use extarnal audio DACs with a B+ or can you still get to the I2S bus somehow. This will be a terrible blow to all the people wanting to use the pi as a high quality media player because the onboard audio (even on the B+) just isn’t good enough! Have another look at the new GPIO pins. its actually simpler to connect a random codex chip than the original B! That is because the interface now requires just one connector, instead of two! Thats because the B’s P5 connector only contained I2S signals, and most codecs need both I2S AND I2C (12S four sound, and I2C for configuration and control), and now the new 40 pins connector offers both! Thats why Wolfson had to use expensive pogo stick connectors, in addition to a 26 pins header for their “soundcard”. Monday, I think. but I hope it’s shipping friday/now! I can’t seem to find one with international shipping. Do you know one that ships internationally (outside U.S and EU) ? I still need A Intel Core i7 @ 4.7GHZ, built in nuclear reactor, toaster oven, and a skynet controler. Can someone tell me whether i can use Micro SDHC 32GB card with model B+? Yes, you can. If you’ve got other questions, swing by the forums (link at the top of the page), where 100,000 users are waiting to help you out! My first thought with this was “Does it have a better fuse to allow more input to supply those extra USB ports?”. After that, my next question was “Based on the extra GPIO pins, do you plan on releasing some form of adapter board to allow ribbon connection of the PiFace? My design idea would be to create something like the PiRack, with 2 original RPi GPIO outputs, and 2 modern outputs. I would love these questions answered! Thank you James for your answer. Sorry for the delay, I just come back from holidays! I confirm that if I have Raspberry CE test reports (not only certificates), there will be less tests to pass for my product. This is what I’ve been said by the certification authority in France. That is why I ask you for this test reports. We do not share that information; you are liable for your own certification. Anybody know if Raspberry Pi model B+ can support direct plug in of a 3G dongle WITHOUT having the Powered USB Hub? Thank you. Does the B+ have POE?! This would be a GREAT feature for this little system. I have the raspberry pi model b running ultimate raspbian, but i just recently bought the model B+ and am trying to install the same version of ultimate raspbian and it won’t boot. Could you reply back giving some insight and maybe explain why it’s not booting. Does it boot with the standard Raspbian? Is so, you should approach the Ultimate Raspbian people to get an updated package. Not so ultimate after all, eh? Today Model B is out of stock until March 2015 (RS and Farnell), i need to buy 1000 units, where is it possible to reach people in charge of Industrial customer ? I’m in the same boat. Need 5K Model Bs and availability is none. It will be good to have point of contact for industrial customers. Some truly amazing features! You guys are legendary. I have Raspberry Pi Model B+ (512MB)[element14]. I am using for do display an Fast Food Restaurant Menu on my HDMI LCD 50″ Screen TV. So now everything fine I run the Fast Food Restaurant Menu (JPEG image file) and make it full screen but after some time the screen go black then I move mouse it come back again. I think it has screen saver. So how can I disabled it? Try Magpi Issue 26, “PI CANVAS Digital art display”. On page 8. This article is very similar to your application. Or post in the Forums, a better place to ask a question like this. Hello sir we are creating a Major project of Raspberry pi cluster B+ Model using an instance for password cracker in Our college .sir Actually I need one help to you .The question is this, Either PI is based on software Model or not ..like as WAterfall or incremental Model ..And another question is this if this is not compitable so why ..? MagPi issue 25 – out now!